Made from durable and sturdy stainless steel and zinc alloy material which makes it long-lasting and perfect for heavy duty. The two-stage operation is very easy to open wine cork with a simple press which takes less than three seconds. Now uncorking the wine bottle is easy than easier. After pulling the cork out of the bottle this Rabbit Wine Opener removes the cork itself even without touching the cork. We perform a successful lab test with this red wine bottle opener tool kit and get an unbelievable result. It proves its heavy duty feature which is ideal for commercial use. The corkscrew also features easy grip function which requires very low pressure. A stylish and luxurious design makes this unique and gives a professional look. There are a few things we can highlight but it comes with a nice gift box which includes Rabbit Wine Opener, Base Stand, Spare Screw and Bottle Cork. 1. The first step in using the opener is to bring the lever firmly down to closed position. 2. Firmly grasp the grip handles with one hand and swing lever to full open position. Put the opener over the bottle until it stops in the exact position. Grip the bottle neck firmly with the grip handles. The black screw comes out of the metal axis. 3. Slowly bring the lever up and return to closed position. The screw has been driven fully into the cork and is ready to pull the cork. 4. Keep a firm grip on the bottle neck with the handles and slowly lift the lever back and over the bottle to the open position. 5. Remove the bottle by loosening your grip on the handles. 6. Take the cork out of the corkscrew. Amado introduces a totally different Rabbit Corkscrew that pulls a wine cork in less than 3 seconds. After pulling the cork out of the bottle this Rabbit Wine Opener removes the cork itself. Opening a red wine bottle was never being so easy and quick before we introduce this red wine bottle opener tool kit. Our engineers are redesigned the classic corkscrew to improve its performance. Easy grip and lever action create pressure at the corkscrew and makes it easy to open the bottle with one simple press. Made with zinc alloy material with plating which makes it unique and durable. The smooth design represents a luxurious look when we keep in mind professional use when manufactured. 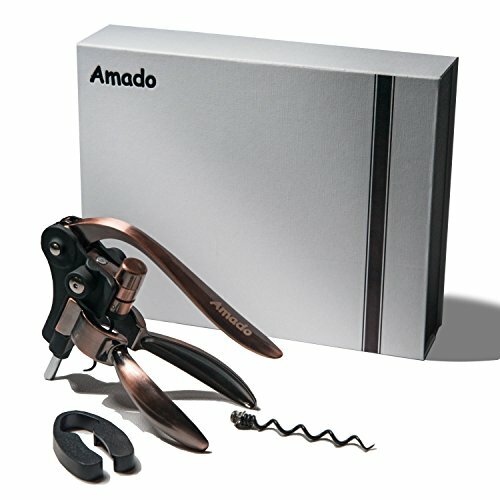 Amado Rabbit Corkscrew worth more than the quality and we provide 6 months quality guarantee. Because of its two-stage operation, heavy duty and durability it is ideal for home, outdoor and commercial use. If you have any questions about this product by Amado, contact us by completing and submitting the form below. If you are looking for a specif part number, please include it with your message.